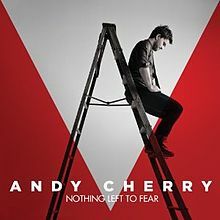 25-year-old worship leader Andy Cherry released his debut single “Our God’s Alive” in September of last year. The single shot up radio charts, beginning fan anticipation for his debut project Nothing Left To Fear. Andy’s skillful song-writing and astounding unique vocals, make Nothing Left to Fear a fantastic worship album, one that will, no doubt, have the listeners hitting repeat after the album plays through. The soft “City of Light” opens up Nothing Left to Fear, a cry for God to awaken our hearts to His love. Already, his unique soft vocals, which remind me of The City Harmonic’s Elias Dummer, are appreciated, as is the heavenly choral effects backing the track. Holding a Psalm 23 sentiment, “Nothing to Fear” follows as a type of a title track, reminding the listener that God is with us through good and the bad times – “Why should I worry when Your love surrounds me? There is nothing to fear/ You are with me.” This strings and acoustic guitar combine very nicely. Adrenaline builds on “To Follow You,” a powerful track of counting it all as loss for the sake of knowing Christ. By the second chorus, the drums build very well, just as I was hoping for. Next, Andy covers “Nothing But the Blood” in a very jubilant way, raising his vocals an octave for authoritative effects. Personally, this was the first track off Nothing Left to Fear that really grabbed me, especially with the power in Andy Cherry’s vocals. Andy Cherry experiments with his higher vocals in the very soft “Running to our Savior,” a celebration of eternal life that we will all find in Jesus Christ when we leave this earth. The radio single “Our God’s Alive” is placed perfectly, actually sounding a bit more powerful on the album, especially when in connection with the other mostly softer tracks. This is a track that must be added to Resurrection Day songbooks! The fun touch is an added bonus. The battle between faith and works is addressed in “He Has Done it All,” as the soft contemporary track speaks of how there is no more to be done – that Jesus has redeemed us and no amount of works will ever save us. It’s a wonderful message, and Andy Cherry did a fantastic job of delivering it. Singing of how “I need nothing but Your love,” “Beautiful Morning” is very heavenly, following nicely. “Divine Embrace” has a Phil Wickham sentiment to it, with the same message of a passionate desire to fall in love with Jesus. Musically, it stands on the stronger side with a nice piano fronting. Finally, “We’ll Sing Forever” closes the album, celebrating the fact that one day we will sing God’s praises around the throne forever and ever. Andy Cherry’s Nothing Left to Fear is simply fantastic! I thoroughly enjoyed taking a listen to his original worship project. Each track has a new element that makes the listen truly worshipful and enjoyable. This album will make the listener an immediate fan!